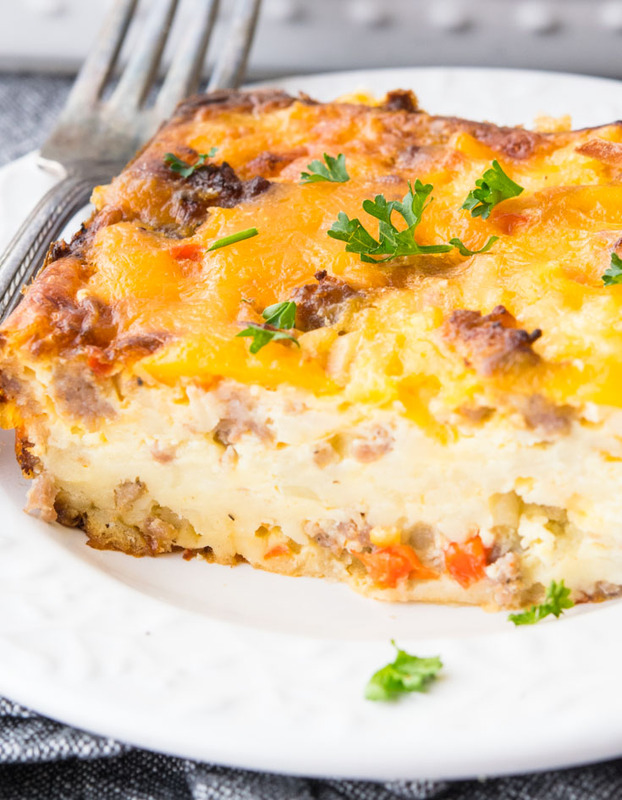 This easy cheesy Bisquick Breakfast Casserole is loaded with sausage, egg, potatoes, and peppers. Famished folks, this feast has your name on it! 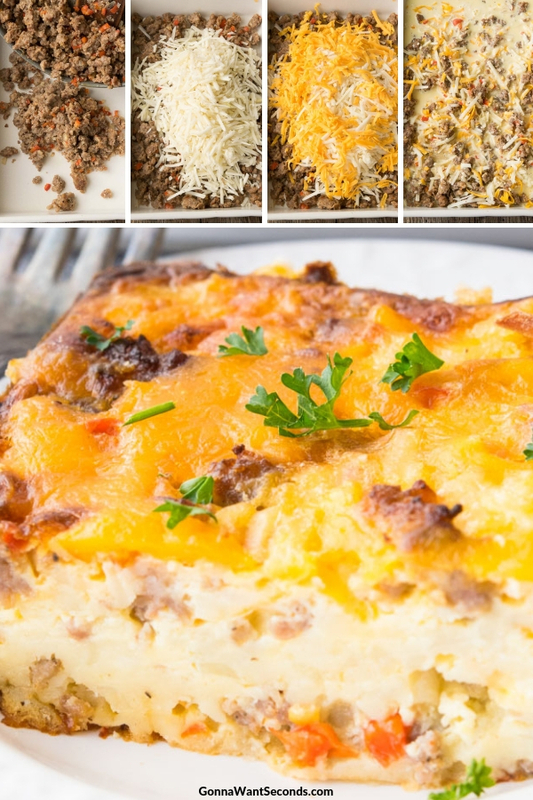 Bisquick Breakfast Casserole is a modern hero in plainclothes. It’s Saturday morning, the rooster has crowed, and your family has begun to prowl around the kitchen like ravenous zombies from the latest thriller. We’ve all been there. Bellies are growling, but you can only seem to locate a few random ingredients: frozen hash browns, eggs, veggies, milk, and … Bisquick? Bisquick Breakfast Casserole, to the rescue! This marvelous dish is so simple to whip together, and it will keep those stomachs from grumbling until the next regularly scheduled mealtime. It does take a solid 45 minutes to bake, however, so it’s best to get a head start on the zombies! Once they have had their fill, though, all they will remember is the gooey cheese, savory pork sausage, and flavorful veggies, and any tardiness will be forgiven and forgotten. Next time you are up against breakfast rush hour, you may like to try my Tater Tot Breakfast Casserole! It makes a generous portion! It keeps you energized all the way to lunch! Anything with cheese both inside and on top is a winner in my book! 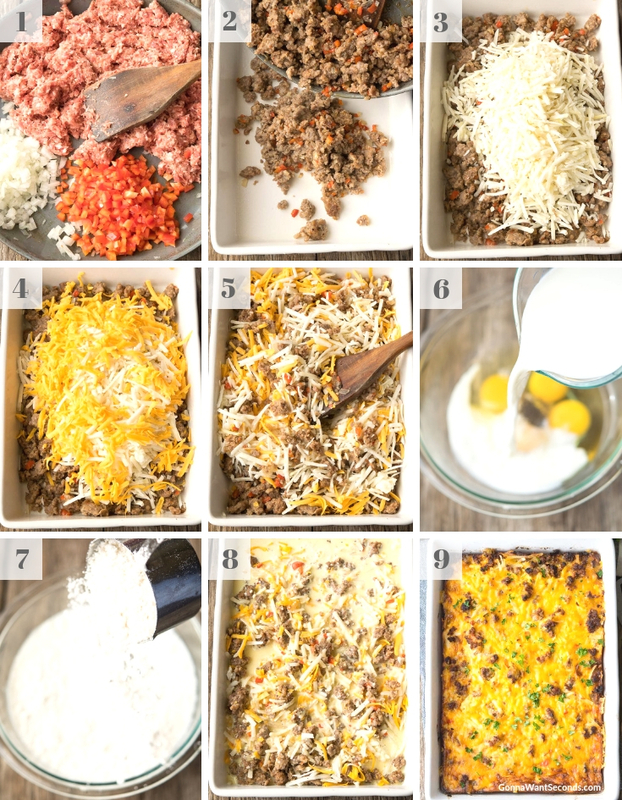 What Ingredients Do You Need To Make Bisquick Breakfast Casserole? Some people make Bisquick breakfast casserole without hashbrowns, but I love the extra texture that they provide! If you really can’t abide hashbrowns, you could make your breakfast casserole with bread slices instead. Breakfast casserole with biscuits lining the bottom of the tray is another common alternative. In addition to 3 cups of frozen hashbrowns, my recipe calls for 24 ounces of bulk pork sausage (flavored ground pork that typically comes in a cylindrical tube), and 4 large eggs. You will also need half a cup of chopped onion, a cup of freshly chopped red bell pepper, a couple of cups of grated sharp cheddar, some Bisquick, milk, salt, and pepper. How To Make Bisquick Breakfast Casserole? 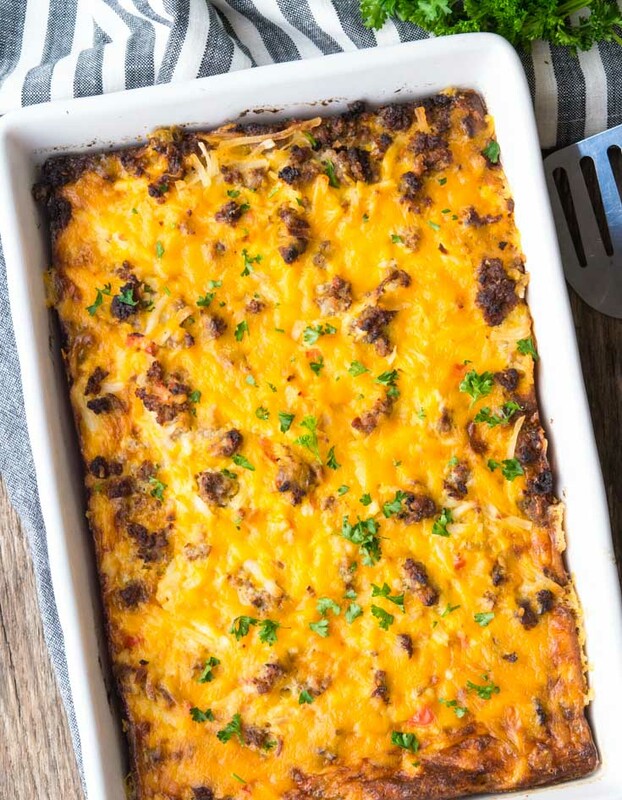 Here’s how to make a breakfast casserole: cook the sausage, onions, and pepper in a skillet, then mix them with cheese and hashbrowns in a baking dish. Pour the Bisquick, milk, egg, and seasoning blend over top, then bake the casserole until it sets! For an added bonus, melt some extra cheese on top. Now you have a delicious Bisquick breakfast quiche! 1. Preheat oven to 400°. Spray a baking dish with nonstick cooking spray. In a skillet, cook sausage, onions, red bell pepper. Stir occasionally until the sausage is cooked through. Drain excess fat. 2. Add sausage mixture in the baking dish. 4. Add 1 1/2 cheese. 6. In a mixing bowl, whisk together eggs, milk, salt, and pepper. 7. Mix in Bisquick into the mixing bowl. 8. Pour Bisquick mixture over sausage mixture. 9. Bake in preheated oven for 40-45 minutes or until it is set in the center. Sprinkle with remaining cheese and bake until cheese is melted, about 5 minutes. Cool before cutting. Serve. This family pleaser is also on the breakfast for dinner list, never a complaint. Why not, all major food groups are represented (pepper is technically a fruit – seeds). It’s yet another recipe on the most requested list! Preheat oven to 400 degrees. Spray a 9X13 inch baking dish with nonstick cooking spray. In a 12 inch skillet, cook sausage, onions, and red bell pepper over medium heat, stirring occasionally, until sausage is cooked through and there is no longer any pink. Drain any excess fat. Add sausage mixture, hash brown potatoes and 1 1/2 Cups cheese to the prepared baking dish and stir until ingredients are evenly combined. In a medium mixing bowl, whisk together eggs, milk, salt, and pepper. Whisk in Bisquick and pour over sausage mixture. Bake in preheated oven 40-45 minutes or until it is set in the center and a knife inserted into the center of casserole comes out clean. Sprinkle with remaining cheese and bake until cheese is melted, about 5 minutes. Cool for 10 minutes before cutting. Serve. 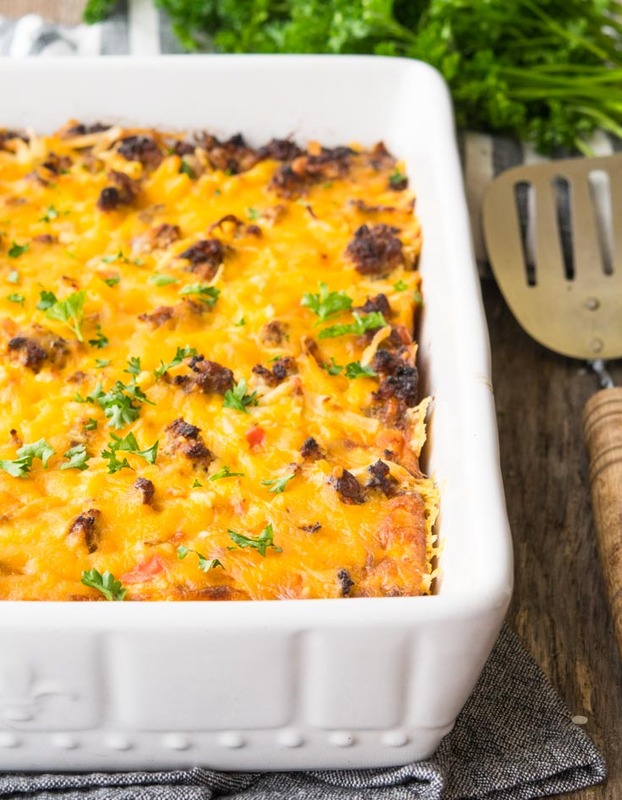 Meat variations: If pork sausage isn’t a favorite, you can also make this Bisquick breakfast casserole bacon style, or try your Bisquick breakfast casserole with ham instead. For those who are vegetarian, vegan, or have protein restrictions, Bisquick egg casserole no meat is another possibility. Bisquick: What is it, anyway? We know it’s a convenience baking mix, with ingredients along the lines of flour, salt, and baking soda, but where did it come from? General Mills has the abbreviated story here. Bisquick is the brainchild of an innovative chef who worked a San Francisco bound train in 1930. How To Make Ahead Of Time: Good news: this recipe doubles as a Bisquick make-ahead breakfast casserole! It keeps in the fridge for 3 – 4 days and in the freezer for 2 – 3 months, according to the FDA. How To Freeze Bisquick Breakfast Casserole:For best results, use an airtight, freezer safe container. You might want to use an aluminum baking dish and lid so the casserole doesn’t hold your good dishes hostage for months. Let the casserole cool down from baking temperatures (on the counter for under two hours, then in the fridge), label it, and pop it in the freezer! Thaw in the refrigerator overnight before you plan to serve. I recommend reheating in the oven to preserve the dish’s texture. What To Serve With Bisquick Breakfast Casserole: Breakfast casseroles go great with something slightly sweet, like fruit salad or yogurt parfait! A simple plate of sliced watermelon, apples, or oranges will also do the trick. Hashbrown Casserole is a truly scrumptious variation of this recipe. Take a gander if you are in the mood for other fabulous potato-filled casseroles! Posting very soon. 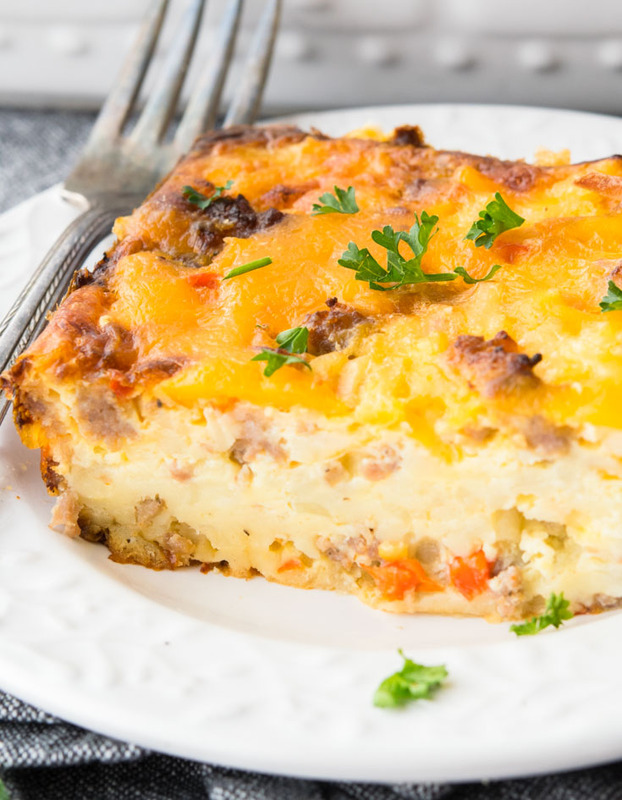 This Breakfast Casserole can get you and your family out of your weekday breakfast rut in a jiffy. Or save it for special occasions – whatever floats your boat! 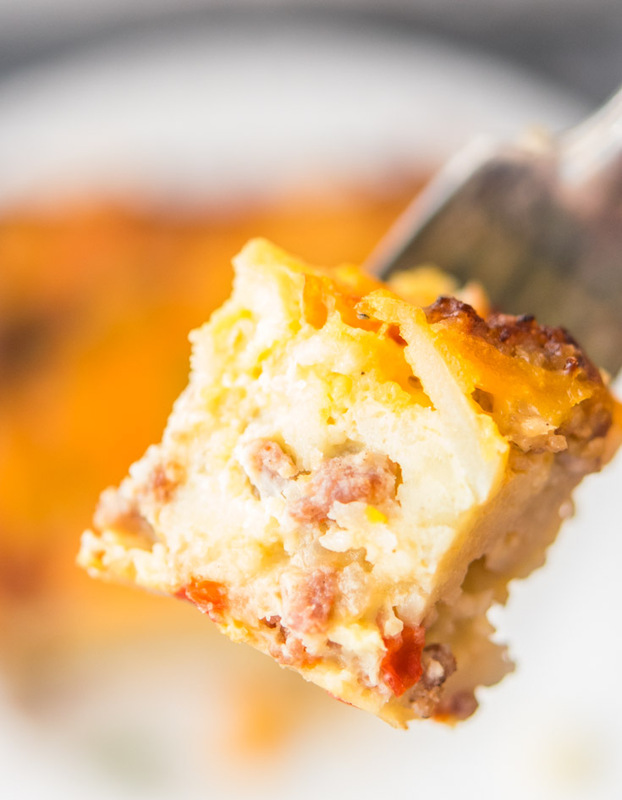 My Overnight Breakfast Casserole is the perfect option for busy mornings! You can do all the prep work the night before, then just pop it in the oven when you wake up. Sausage and Egg Casserole is a classic! You can’t go wrong with this standard breakfast dish. The name says it all! Check out my Easy Breakfast Casserole on days when you just can’t be bothered with one additional chore! 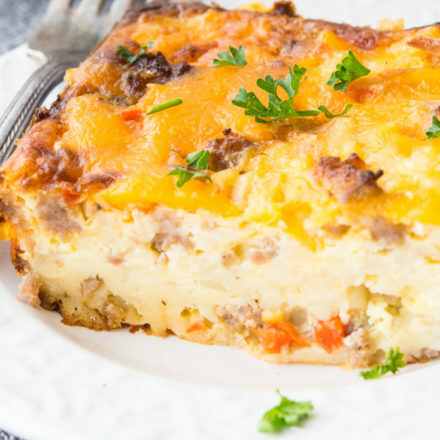 Sausage Breakfast Casserole ranks right up there with pancakes and waffles as a traditional, delicious, and filling way to start the day. As they say, I saved the Best Breakfast Casserole for last. You won’t be disappointed with this family favorite. If this whets your appetite for more Bisquick Recipes creations, try my Bisquick Sausage Balls, Impossible Cheeseburger Pie Recipe With Bisquick, Bisquick Chicken Pot Pieor Bisquick Peach Cobbler Recipe! Don’t forget Bisquick Coffee Cake for breakfast! Whether you have your stomach set on something sweet or savory, I’ve got you covered! Yum! Easy and delish! Husband approved too! Thank you for sharing! This breakfast casserole is the bomb!! Making it soon! I have been making this recipe for years. It’s my husband’s favorite breakfast! Interesting recipe I want to try. However, I will not use boxed Bisquick, as the flour comes from GMO seed. When they decide to fix that, I’ll be happy to go back to using it. In the meantime, I make “Bisquick” from scratch.